Dubai, UAE, June 9, 2018: If the Graham Chronofighter was a novel, it would be a page-turner that propels the reader from one cliffhanger to the next. 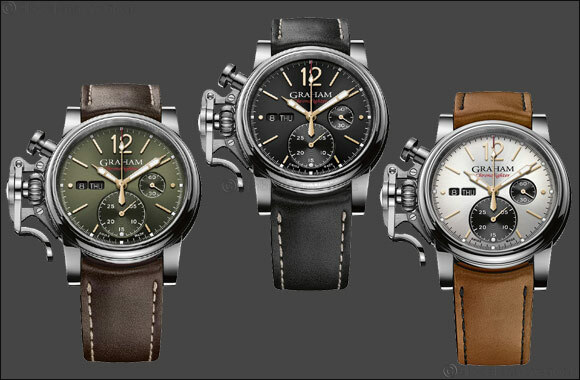 The latest “reveal” comprises three versions of a timepiece with a plot inspired by 1940s aviation history. This quintessential stopwatch series was launched in 2001, alongside celebrity newborns such as Wikipedia and the iPod. The 2018 Graham triplets combine the iconic design, characterized by its signature trigger, with vintage colours. These distinguished timepieces are flying the flag for mindful masculinity. The inspiration of yesteryear military pilots is the heart and soul of the Graham Chronofighter Vintage. Positioned prominently on the left of the 44 mm case, the thumb-actuated trigger whisks the imaginations of contemporary tough guys to leather flying jackets and analogue cockpits. Chronograph activation has never felt this way before. The chronograph functionality comprises two easily legible counters, one to trace seconds and the other to count 30-minute periods. The passage of hours, minutes and seconds, as well as days, holds the attention of the main dial. The newly recruited timekeeping squadron takes in silver, khaki and black dials, teamed with hand-sewn calf leather straps in camel, dark brown or black. Their engine is a G1747 automatic chronograph movement with an Incabloc shock absorber. This is visible through the case back and also contains power reserve of 48 hours. All Graham Chronofighter watches are water resistant to 10 bar (100 meters) and equipped with a domed sapphire crystal with anti-reflective coating. Having friends in high places just took on a whole new meaning.